Lichen planus is a chronic mucocutaneous disease that affects the skin and the oral mucosa, and presents itself in the form of papules, lesions or rashes. Lichen planus doesn’t involve lichens; the name refers to the appearance of affected skin.The name of condition was provided by British physician Erasmus Wilson ,who first described it in 1869.Lichens are the primitive plants composed of symbiotic algae and fungi.The term planus is latin for flat.Even though the term lichen planus suggests a flat ,fungal condition ,current evidence indicates that this is an immunologically mediated mucocutaneous disorder. The cause of lichen planus is not known. It is not contagious and does not involve any known pathogen. Some lichen planus-type rashes (known as lichenoid reactions) occur as allergic reactions to medications for high blood pressure, heart disease and arthritis. These lichenoid reactions are referred to as lichenoid mucositis (of the mucosa) or dermatitis (of the skin). Lichen planus has been reported as a complication of chronic hepatitis C virus infection and can be a sign of chronic graft-versus-host disease of the skin. It has been suggested that true lichen planus may respond to stress, where lesions may present on the mucosa or skin during times of stress in those with the disease. Lichen planus affects women more than men (at a ratio of 3:2), and occurs most often in middle-aged adults. Lichen planus in children is rare. In unpublished clinical observation, lichen planus appears to be associated with hypothyroidism in 3 young females.Allergic reactions to amalgam fillings may contribute to the oral lesions very similar to lichen planus, and a systematic review found that many of the lesions resolved after the fillings were replaced. The typical rash of lichen planus is well-described by the “4 P’s”: well-defined pruritic, planar, purple, polygonal papules. The commonly affected sites are near the wrist and the ankle. The rash tends to heal with prominent blue-black or brownish discoloration that persists for a long time. Besides the typical lesions, many morphological varieties of the rash may occur. The presence of cutaneous lesions is not constant and may wax and wane over time. 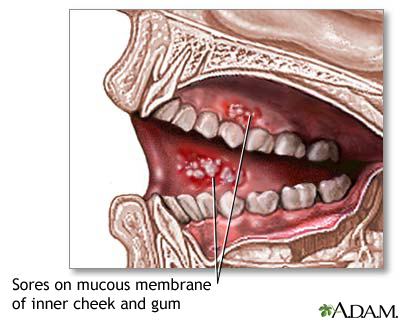 Oral lesions tend to last far longer than cutaneous lichen planus lesions. Oral lichen planus (OLP) may present in one of three forms. * The reticular form is the most common presentation and manifests as white lacy streaks on the mucosa (known as Wickham’s striae) or as smaller papules (small raised area). The lesions tend to be bilateral and are asymptomatic. The lacy streaks may also be seen on other parts of the mouth, including the gingiva (gums), the tongue, palate and lips. * The bullous form presents as fluid-filled vesicles which project from the surface. * The erosive form presents with erythematous (red) areas that are ulcerated and uncomfortable. The erosion of the thin epithelium may occur in multiple areas of the mouth, or in one area, such as the gums, where they resemble desquamative gingivitis. Wickham’s striae may also be seen near these ulcerated areas. This form may undergo malignant transformation. * Cutaneous lesion only ocassionlly associates . Lichen planus may also affect the genital mucosa – vulvovaginal-gingival lichen planus. It can resemble other skin conditions such as atopic dermatitis and psoriasis.Rarely, lichen planus shows esophageal involvement, where it can present with erosive esophagitis and stricturing. It has also been hypothesized that it is a precursor to squamous cell carcinoma of the esophagus. Care of OLP is within the scope of Oral medicine speciality. Currently there is no cure for lichen planus but there are certain types of medicines used to reduce the effects of the inflammation. Lichen planus may go into a dormant state after treatment. There are also reports that lichen planus can flare up years after it is considered cured. * Oral and topical steroids. Patients are sometimes concerned that lichen planus is infectious and should be reassured that tis is not so.Although oral lichen planus cannot be cured completely ,some drugs can provide symtomatic relief and satisfactory control.Corticosteroids are single most useful group of drugs in the management of lichen planus.The rationale of their use is their ability to modulate inflammation and the immune responce.Corticosteroids such as Beclomethasone from aerosol inhalers used for asthma can be used effectively -approx six puffs from inhaler is enough for the lesion.Triamcinole applied to the lesion is an alternative form of the treatment.Gingival lichen planus is most difficult to treat.It is essential to maintain rigourous oral hygiene .In erosive LP ,one of the stronger topical corticosteroids like Fluticasone nasal spray ,Fluocinolone,Betamathasone,Clobetasol gel applied several times per day to the most symtomatic areas is usually sufficient to induce healing within 1-2 months.The patient should be warned that he condition will undoubtedly flare up again in which case the corticosteroids should be reapplied.In addition the possibility of iatrogenic candidiasis associated with corticosteroids use should be monitored .Nystatin or Amphotericin-B suspension /Miconazole can be given in conjugation with the above. In some cases where topical therapy fails systemic corticosteroids are effective.Antioxidants OD for Six months help improve condition.In exceptionally unresponsive cases ,tacrolimus/pimecrolimus moth rinses may be effective which must be given under strict medical supervision.Immunoregulators like levamisol have found to improve the condition of patient chronically on corticosteroids. Non-Hodgkin lymphoma (NHL) is uncommon. It is the second most common group of malignancies, behind only squamous cell carcinoma.It accounts for 3.5% of intraoral malignancies but rarely arises on gingiva.Most of these are high grade diffuse large B -Cell lymphomas. Diagnosis of an NHL of the oralcavity is often diifficult bacause it may resemble other conditions such as dental abcesses or can mimic other pathological conditions eg. fibroma ,periodontal disease. The radigraphic aspect of NHL is also not chracteristic. Frequently,NHL presents as a local ,painless swelling without ulceration andaccompnied by pain or discomfort in the throat .These local symtoms can also be associated with systemic symtoms called B -Symtoms.Lymphoma should be considered in he presence of a gingival swelling accompnied by tooth mobility, ulceration and unexplained dental pain or numbness.Histologic and immunophenotypic studies are therefore important in establshing the diagnosis.Most patiets with NHL of the head and neck have , at presentation , a stage 1 or 2 high grade diffuse large B-Cell Lymphoma. * Stage I indicates that the cancer is located in a single region, usually one lymph node and the surrounding area. Stage I often will not have outward symptoms. * Stage II indicates that the cancer is located in two separate regions, an affected lymph node or organ and a second affected area, and that both affected areas are confined to one side of the diaphragm – that is, both are above the diaphragm, or both are below the diaphragm. * Stage III indicates that the cancer has spread to both sides of the diaphragm, including one organ or area near the lymph nodes or the spleen. * Stage IV indicates diffuse or disseminated involvement of one or more extralymphatic organs, including any involvement of the liver, bone marrow, or nodular involvement of the lungs. * A or B: the absence of constitutional (B-type) symptoms is denoted by adding an “A” to the stage; the presence is denoted by adding a “B” to the stage. * E: is used if the disease is “extranodal” (not in the lymph nodes) or has spread from lymph nodes to adjacent tissue. * X: is used if the largest deposit is >10 cm large (“bulky disease”), or whether the mediastinum is wider than 1/3 of the chest on a chest X-ray. * S: is used if the disease has spread to the spleen. * CS – clinical stage as obtained by doctor’s examinations and tests. * PS – pathological stage as obtained by exploratory laparotomy (surgery performed through an abdominal incision) with splenectomy (surgical removal of the spleen). Note: exploratory laparotomy has fallen out of favor for lymphoma staging. Treatment of extranodal NHL includes surgical excision followed by chemotherapy sometimes with associateds radiotherapy.Primary NHL of gingiva can mimic other lesions.It is therefore necessary to perform a histologic examination in cases where signs and symtoms persist,despite treatment . An yearly biopsy will provide an approprite diagnosis and avoid disease progression ,thus improving the pronosis. Other common symptoms of TMD include toothaches, headaches, neckaches, dizziness, earaches, hearing problems, upper shoulder pain, and ringing in the ears (tinnitis). Because many other conditions can cause similar symptoms to TMD – including a toothache, sinus problems, arthritis, or gum disease – your dentist will conduct a careful patient history and clinical examination to determine the cause of your symptoms.Treatments for TMD range from simple self-care practices and conservative treatments to injections and surgery. Most experts agree that treatment should begin with conservative, nonsurgical therapies first, with surgery left as the last resort. Many of the treatments listed below often work best when used in combination. Basic treatments include * Apply moist heat or cold packs. * Eat soft foods. * Take medication To relieve muscle pain and swelling. * Low-level laser therapy. * Wear a splint or night guard. * Undergo corrective dental treatments. * Don’t rest your chin on your hand or hold the telephone between your shoulder and ear. * Keep your teeth slightly apart as often as you can to relieve pressure on the jaw. * Learning relaxation techniques to help control muscle tension in the jaw.More Controversial Treatments for TMD include * Transcutaneous electrical nerve stimulation (TENS). * Ultrasound treatment. * Trigger-point injections. * Radio wave therapy. * Surgery for TMD .There are three types of surgery for TMD: arthrocentesis, arthroscopy, and open-joint surgery. The type of surgery needed depends on the TMD problem. Our dentists are fully trained and equipped to diagnose and treat the pain of TMJ. If you are suffering from a painful face, jaw or neck and have been unable to get to the root of the problem with conventional diagnoses, make an appointment to see a dentist and ask about TMJ. If you notice a popping sound when you open your mouth, it may be time to ask your dentist about treatments for TMJ disease. In a similar way, if you tend to have headaches, facial pain, or neck pain they may all be cause by some type of malfunction of your jaw joints. Fortunately, when you visit a dentist, you will be able to receive treatment that will ease, or even eliminate your pain altogether. In order to begin treatment, your doctor may need to conduct some tests in order to determine the cause of your jaw pain. Typically, this will involve taking xrays, as well as asking you a series of questions. Your dentist may also want to do some additional testing to see if the pain is being caused by gum disease, or other issues that cause refractory pain in the facial nerves. Once your dentist is able to find the cause of your pain, it will be possible to treat your condition. This may include providing you with a mouth guard to prevent teeth grinding. If your dentist determines that misaligned teeth are causing your jaw pain, you may need to have braces, or other devices that will move your teeth into the correct position. Today, there are a number of dental alignment aides that cannot even be seen, let alone felt while you are wearing them. When seeking treatment for jaw pain, it is important to realize that there are several major nerves that run through your face and neck. As a result, your pain may actually be located in the jaw, or in some other area. Therefore, your dentist will need to eliminate a number of possible issues with diagnostic testing in order to solve your problem. Fortunately, you will find that treatment for TMJ disorders will not be any worse or distressing than any other procedure designed to improve your dental health. If a person maintains a good oral hygiene, tooth abscess will unlikely to occur. Tooth abscess is an infection of one tooth or the root of the tooth. If you have tooth abscess, it is important that you consult and seek treatment with your dentist to prevent spreading the infection to other teeth. • Existing tooth infection – when a dental procedure was performed on your tooth such as filling, root canal or crown, the infection was already in the tooth. The dental work failed to kill the bacteria which will later turned into tooth abscess. • Weak immune system – a tooth abscess may be caused by a germ resident in the tooth and a weak immune system may have failed to fight the infection brought about by this germ. • Age-related – as a person ages, his tooth weakens which allows a germ to enter and caused infection. • Facial swelling in cases that tooth abscess penetrated to the bone and started draining into tissues surrounding the tooth. • Root canal treatment which involves drilling of the infected area, cleansing and resealing the infected tooth. TMJ, TMD or TMJD, temporomandibular disorder is a condition affecting the temporomandibular joint (TMJ) , which connects the mandible or the lower jaw to the temporal bone of the skull, which is located in front of the ear. The TMJ includes the muscles surrounding the jaw, blood vessels, bones and nerves. A person will have two TMJs, one located on each side of the jaw. •The most common symptom of TMJ disorder is pain, with intense discomfort not just in the face and jaw joint, but also the neck and shoulders. •You may experience an overstretched feeling in your joints, and may also suffer from muscle spasms. •There is pain during jaw movements like talking or yawning. •There can also be ear paining, tinnitus or ringing in the ears, or even hearing loss. •You may even hear a clicking or popping sound when you move the joint. The sounds may be audible to other people also. •There may be swelling of the face and mouth. •There may be a shifting in the position of the teeth, or a change in the bite. •You may find it hard to open the jaw fully, or the jaw may shift to one side after opening. •You may experience trouble while swallowing. •There could be nausea, headache or dizziness. Since TMJ is accompanied by an onset of pain we will gauge the intensity of pain by administering a “clench” test. If you experience pain in any one tooth or all teeth or the jaw when you bite down, dentist will diagnose it as TMJ. To confirm this diagnosis and to evaluate the position of the temporomandibular joint, your dentist will create mold impressions of your bite, and mount these on an articulator. Through this, your dentist can determine if there is a structural disorder inside the joint, or other factors like uneven teeth are affecting the joint. If your dentist believes that your problem is caused by a structural disorder, and if your pain is not relieved through occlusal equilibration or the use of splints, then he will recommend an X-ray. Finally, he may recommend orthodontia, an intra-oral appliance or maxillofacial surgery, depending on the results of the scans. He will refer you to an oral surgeon or a maxillofacial surgeon. Surgery is performed under local anesthesia. Here, two needles are inserted into the temporomandibular joint, one connected to a syringe containing a cleansing solution, and the other acting as an exit for the fluid. This procedure is used to wash out the joint. In some cases, your surgeon will make use of a scalpel like tool to remove any tissue adhesions in the joint. •Apply hot and cold packs to the side of the face to lessen the pain. The pack should be applied for 10-minute durations. •Avoid yawning or other extended jaw movements, and limit the amount of pressure you place on your jaw. •If you are under any dental treatment for tooth decay, continue with the treatment. •Massages and biofeedback can also offer some relief from TMJ. •Anti-inflammatory drugs, anti-anxiety drugs and anti depressants can provide relief from intense pain. •Dental appliances like mouth guards can reduce teeth grinding which can enhance your bite, enabling your lower jaw to fit properly into the TMJ socket. If you notice jaw pain occasionally, avoid eating hard foods, chewing gum or biting on hard objects. Support your lower jaw with your hand when you yawn. If you find yourself grinding your teeth or clenching your jaw at night, consult your dentist – he may be able to design a splint for you to protect your teeth.